An artist's illlustration of the Thuraya 2 satellite. PARIS — Mobile satellite services operator Thuraya Telecommunications says it has "conclusive evidence" that Libya, one of its shareholders, is the source of "unlawful and intentional jamming" of Thuraya signals in Libya and surrounding areas over the past week. The Dubai, United Arab Emirates-based company, which has dealt with Libya-based jamming in the past, said its technical teams are working to reduce the impact of the jamming and that, as of Feb. 25, "voice services were restored over much of the country." The Thuraya-2 satellite's network is operational, it said, but is still contending with jamming attempts at its beams serving Libya. 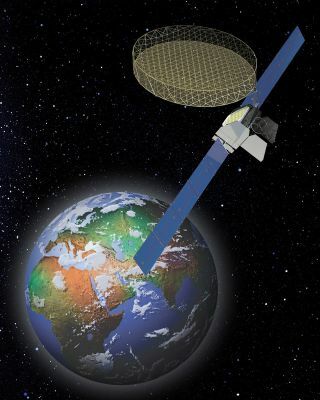 Thuraya-2 is a large mobile communications satellite built by Boeing Satellite Systems International and stationed at 44 degrees east in geostationary orbit. Thuraya also operates Thuraya-3, stationed at 98.5 degrees east. The Thuraya statement, released on Friday (Feb. 25), follows similar complaints from Arab television broadcaster Al Jazeera, which said its signals into Libya had been jammed, and that the broadcaster had traced the jamming's source to a Libyan intelligence service facility south of Tripoli. Since the rebellion in Tunisia in December that spread to Egypt, Bahrain and now Libya, Al Jazeera has been forced to contend with multiple jamming attempts that have led it to switch broadcasts among transponders aboard satellites operated by Eutelsat of Paris, Arabsat of Saudi Arabia and Egypt's Nilesat. Thuraya suffered repeated jamming in 2006 that affected its revenue and took the company months to identify. Ultimately it determined that the sources were several Libyan military installations that may or may not have been aware of the effect of their actions. A diplomatic initiative successfully ended the jamming.